In Part 1, I revisited a puzzling 1968 study (supported by follow-up articles) that concluded teaching method has no impact on final exam performance. In Part 2, I explored a possible conclusion of these results: we should focus on learning, not teaching, and we should accept student effort and study time as the main difference makers in exam performance. This doesn’t mean that teachers do not matter. Instead, it means that pedagogy is less important than whether or not learning is actually happening. And, as I suggest in Part 2, cognitive research may help us learn how to learn. So how can teachers teach in support of learning? In Jurassic Park, scientists alter DNA in order to breed females exclusively and restrict natural reproduction. Life finds a way (via mutations or some rare gender-jumping frog DNA) around these limitations, and natural reproduction goes on. Once we start to look at the results of The Teaching-Learning Paradox this way, we should see the results as positive. Student learning will not be stopped. However, instead of designing classrooms as obstacles to learning, we should find a way to support the learning that wants to occur naturally. I do not have too many answers here, but I will introduce three interrelated terms as a start: Attention, Memory, and Intensity. 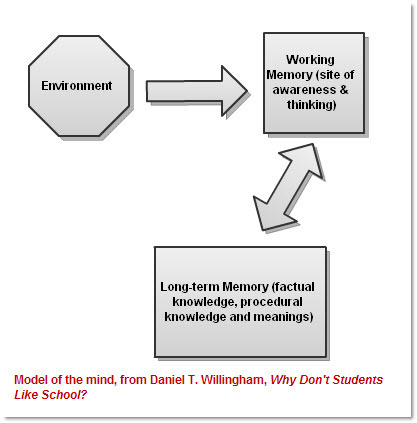 I would then couple this model with John Medina’s argument in Brain Rules that we most effectively store information in our memory when it is organized in a “top-down” manner. That is, instead of imagining a long list of vocabulary terms to be crammed into the brain like a scroll of paper inserted into a shredder, we should group and “chunk” information into concept-category that are big enough to hold a lot of related knowledge. Think of the mind as a series of drawers (I like the phrase “junk drawer”). One drawer might be “Romanticism.” (I have a drawer like that.) Once that drawer has been established and the key concepts and terms defined, you can open it up whenever you want and dump more stuff in. Then, when you want to remember something related to it, you don’t have to go rifling through all of your junk. Just pull out the Romanticism drawer. Items in that drawer tend to stick together and have interrelated functions. One final note on “intensity.” Students do not pay attention when they’re bored. Sometimes this can’t be helped. As your mother used to say, “Only boring people get bored.” Some students would be bored watching live footage of an alien invasion on CNN. Don’t worry about it. Also, we should avoid thinking of education as entertainment, and we should avoid trying to be too “current” and “hip” in an effort to relate to what we think the students are into. Usually we’re wrong anyway, and then we come across as condescending ninnies. However, we should not underestimate how tired and distracted and typically underwhelmed students can be. Sometimes this is their fault, and sometimes it’s not. I think students are desperate for reasons to pay attention. Be intense. Be interesting. Be funny, if possible, but be all of those things in service of learning. Many students just need to see that what you’re teaching is worth getting excited about. 1. All people are ideologues*. 3. You know what goes here. If you reject the premise, you probably want to stop reading. You are the problem. If you accept the premise, you also probably want to stop reading. Some unpleasantness flows from it. There is a secret that snakes through the history of education research. In fact, it’s not even a snake. A snake could easily slip into the rushes and go unnoticed. What I’m writing about looks more like a roaring springtime river bloated with snowmelt. Don’t fall in. Lecture? Lecture plus discussion? Small group work? One-one-one tutorials? Self-directed independent study. No difference. Regardless of method, students will earn the same grade on the final examination. Just to repeat: When measuring the performance on college final examinations, lecturing is no worse or better than other methods (despite the lecture’s oh-so authoritarian overtones). In fact, it does not matter one whit which teaching method is employed. Sure, 1968 is a long time ago, but The Teaching-Learning Paradox has been cited over 200 times since then, and there is widespread agreement on its conclusions. Medical educators seem particularly drawn to (and perhaps repulsed by) its conclusions. This is unsurprising given the importance of final exams in medical school, and the heavy content-knowledge required to become a medical professional (again, Rubin and Taveggia are measuring the kind of end-of-semester knowledge acquisition that many of us may find limiting). If we put so much money, time and energy in such huge curriculum experiments, some day the community might not remain satisfied with the consistent finding of ‘no difference’. This lines up nicely with Dubin and Taveggia’s conclusions. If I can take some liberties here and subvert Marshall McLuhan, it’s the message, not the medium. In fact, as Dubin and Taveggia note, there are only two factors that are consistent in all 91 studies they analyzed: students enrolled in a course, and each course featured a textbook. Lecture at them. Make them watch you on TV. Make them do the work on their own. Make them log into a website. Tutor them. You guessed it: No Difference! Are you drowning yet? Rethinking your teaching method? Wondering whether or not this huge push for more interactive, student-centered learning environments (think ice-breakers, small group work, group projects, student agency, one-one-sessions) has been a complete waste of time? Well, yes. Yes it has. That is, if your central goal is to deliver content. The evidence seems clear. At the end of the semester, students will know about the same amount of stuff regardless of teaching method***. Read The Teaching-Learning Paradox and then sit through some faculty training on how to engage students. If you’re not furious, you can’t do math. Dubin and Taveggia’s work is lucid and straightforward, and seems to be supported with each new study on teaching methods. If your goal is for your students to obtain content knowledge by the end of the semester, you should be in open revolt against anyone who suggests that one teaching method is superior to another. It simply isn’t true. Some call it the VanderBlij Effect, after the Dutch math professor who delivered remarkably clear lectures. However, students attending his lectures usually received lower grades at the test than those who had not attended his teaching. The latter were forced to study so hard to master the material that they really grasped it. But the effect we are discussing may affect students in both groups. The lesson of The Teaching-Learning Paradox is that if instructors apply their own methods (whether instructor-centered or student-centered) it will not make a difference. Hence, Ten Cate’s question, “What Happens to the Student?” He claims that the studies Rubin and Taveggia analyzed (and almost all subsequent studies that support their conclusions) have three massive flaws: First, they confuse an independent variable for a dependent variable. That is, the results of a final examination are not really the result of the teaching method, they are an extension of it. This is why, potentially, all of the final exam results do not vary. Second, these studies are not truly blind, and can never be. If they students know they are being taught, they will act differently. Third, the effects on the student are not being measured. Is education simply about inputs and outputs? Is it merely about transferring knowledge? Shouldn’t we be looking for models that measure the effects on student behavior, which is, ultimately the one factor that can make a difference, if we extrapolate from the above mentioned studies on “studying,” and on the true meaning of the VanderBlij Effect? Maybe The Teaching-Learning Paradox does not present a paradox after all. It might simply be an infinite regress. When the twin mirrors of content delivery and final examination are made to face one another, you get a perfect, endless, pointless reflection. *Perhaps I’m abusing this term. I simply mean that everyone operates from within a particular perspective or set of perspectives, and that we often, consciously or not, make judgments about the world based on assumptions that our perspectives are superior to others. I’m doing it right now. One purpose of this blog post is to point out that educators often charge forth into the classroom under the assumption that their methods of instruction (whether cutting edge or traditional) are the most effective ones available. Evidence to support such claims does not exist. **The results of the study hold true for different mixtures of methods, such as combing lecture, discussion, and small group work. *** Later, I hope to discuss the difference between “teaching method” and “teaching style.” I will also discuss some more recent cognitive research. It may well be that “style” is another “method,” and that style will also make “no difference.” I hope not.